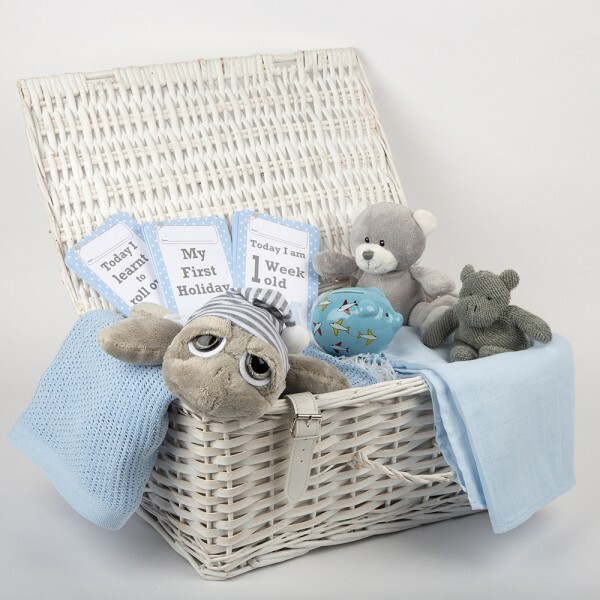 A gorgeous new Baby Boy has arrived and what better way to say ‘Welcome to the World’ than with a wonderful hamper overflowing with beautiful gifts? Sleepy light grey turtle Shelldon has adorable silver glitter over-sized eyes and a grey and white stripy nightcap finished with a velvety soft pom-pom. His white shell has embroidered moon and star detail and gently glows in the dark! Swamp Hippo Snuggle Tot is a super tactile squidgy animal with the comforting texture of a flannel or towel. He has velvety soft inner ears and stitched facial details and is perfectly sized to fit into small hands. As he is bean-filled you can squish and squash him and he’ll still be your best friend! There’s a happy little soft grey and white teddy bear with embroidered eyes, nose and mouth that Baby will love. Save Baby’s pennies with this baby blue ceramic piggy bank decorated with colourful aeroplanes. There is a money slot in the top and a plastic bung underneath; comes with an illustrated gift box. 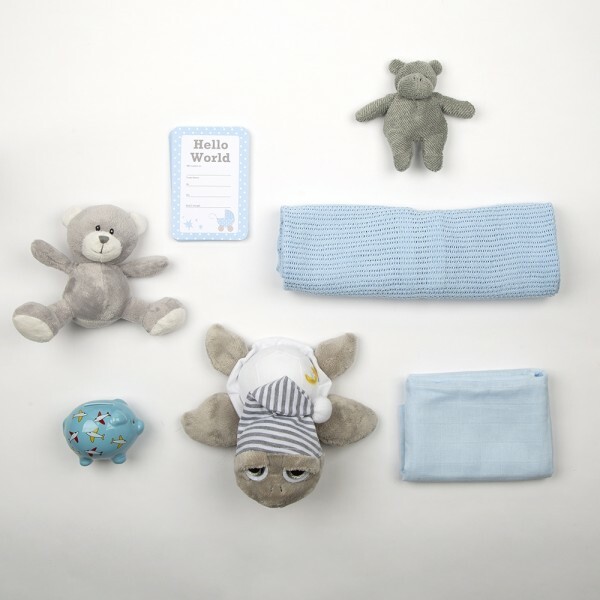 A baby blue soft touch 100% cotton blanket and large baby blue muslin square completes the collection.